The zodiac sign of a person born on this day is Pisces ♓ (The Fish) – a mutable sign with Water as element. February 29 is also known as leap day. It is an additional day added to a calendar if the year is divisible by 4 and not divisible by 100 but divisible by 400. Examples of leap years are 1600, 2000, 2004, 2008, 2012, 2016, 2020, and 2024. Examples of years that are mistaken to be a leap year are 1700, 1800, 1900, 2100, 2200, and 2300. Famous Feb 29 birthday celebrants include James Mitchell, Majesty Rose, Alex Rocco, Joss Ackland, Chris Conley, Ken Foree, Michèle Morgan, Tempest Storm. 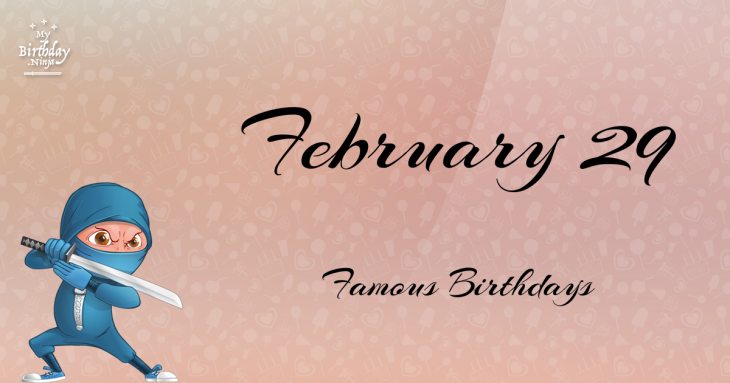 The following famous people celebrate their birthday on February 29th. The list is arranged in chronological order and includes celebrities like actors, actresses, models, singers, rappers and producers. Click the after the name to explore the birth date info and know the meaning of their life path number. The epic list contains 121 persons. Showing 1 - 30.